In recent weeks we have heard numerous reports of people speaking to the media explaining why they traded their Chevy Bolt for a Tesla. However, there are a number of Chevy Volt owners who simply want to go all-electric, but with less expensive options. Their comparison is between the Volt, Nissan Leaf and Chevy Bolt. Yet, there are situations in which keeping the Volt is a better choice for them. "I am about ready to turn in my Chevy Volt and am looking at the Chevy Bolt or the Leaf. I don’t have a charging station at home. There is an expensive fast charger at the local municipal power company. I rent in a condo complex. The carport where my car is parked has solar panels, but I am not sure how those may be hooked up to my meter, which is about 100-200 ft away," writes and asks Jeanne Lahaie at the SF Bay Area Nissan Leaf Owners public group on Facebook. In these types of situations the group members, who are mostly Nissan Leaf owners, suggest either keeping the Chevy Volt or going for the Bolt. Here is why. Thomas Crummett, who has also contributed a story to Torque News about how to use Nissan Leaf's Trip Computer, writes that in this situation it's better to keep the Volt vs the Leaf or Bolt. 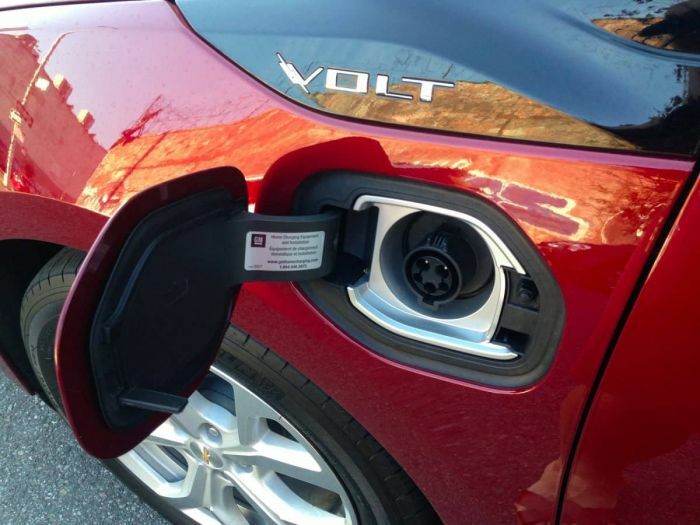 "I would say the Volt is a better choice if you don't have regular access to low cost charging. Sometimes the station rates exceed the cost to travel on gas as well," Crummett writes. "Keep the Volt! I moved to a place with street parking and being unable to charge my Leaf at home is super problematic. I wish I had bought a Volt instead," suggests Elizabeth Danae from the group. Really, without reliable home charging it's difficult to go all-electric. In this situation it's better to keep the Volt or get another Volt. Also, you can think of getting another plug-in option. However, if you insist on full electric, get the Chevy Bolt. "Periodic quick charging for a 238 mile pack will make a big difference. Oh, and thermal management," suggests Felix Truong. Thermal management is something that the Nissan leaf sadly lacks. It tends to keep the battery in a sub-optimal state, which can lead to accelerated wear. The Leaf only has a heater to prevent the battery from freezing, but nothing beyond that in terms of warming it up before scheduled departure (but it will heat the cabin). Here is a good comparison of the Chevy Bolt vs the Nissan Leaf. In this comparison you can find an entire section dedicated to the Active Thermal Management that the Bolt has and it's one of the advantages of the Bolt vs the Nissan Leaf. I read that one person switched to Tesla because of the Supercharger network. That rather laugahable and shows the extent to which EV buyers/owners are ignorant of the current EV charging situation. While their current Bolt will likely never recharge at Supercharger speeds, practically all of the upcoming 130 plus non-Tesla EVs (which all, except Nissan) use the de facto univeral worldwide CCS charger standard ,which is capable of recharging twice as fast as Tesla's Supercharger.And with CCS EVs outnumbering Tesla EVs by more than 30 to 1 the CCS charging network will be gigantic, with stations located practically on every streetcorner, as opposed to the sparsely located Supercharger stations, usually more than 50 miles apart. And Tesla's Supercharger network is a monopoly, with zero competition between stations, whereas the CCS network stations are in competition with one another , guranteeing the lowest practical prices. THe future is clearly a CCS protocol future and no one should buy a vehicle that depends upon a company store. The only sensible way to go for now is the Chevy Volt. I gave my 2012 Volt to my grandson with 118k and the battery still performs like new. My 2018 Volt gets me easily 55-60 miles on a charge and I can drive it cross-country or anywhere without ever having to worry about charging. We're all hoping advanced battery technology or instant charging supercapacitors or graphene or whatever will be coming in the very near future but sensible reality for now is the Volt. It's a shame that most people don't understand the virtues of the Volt nor do many Chevy dealers and even the salespeople. GM failed on training dealers and promoting this amazing vehicle. It's not that Chevy dealers don't understand the virtues of the Volt, it's that they DO. Maintenance costs are so low that they don't have a vested interest in selling them. This is a failure of the manufacturer/dealer business model. Also, it's not clear that GM is fully committed to selling them either given the complete lack of marketing dollars. Looks like they are in it for the ZEV credits and R&D aspects. At least GM seems committed to an electric future, but pushing alot of Volts was never part of the game plan. They DO seem a bit more committed to the Bolt.... but not most of the dealers. I agree that dealer sales staff knowledge regarding how a Volt actually works is abysmal. Love my '14 Volt btw! Oh my goodness! Impressive article dude! Thanks, However I am experiencing difficulties with your RSS. I don?t know why I cannot join it. Is there anybody getting similar RSS problems? Anyone who knows the solution can you kindly respond? Thanks! !